from High Voltage Press: At last, the combined edition! 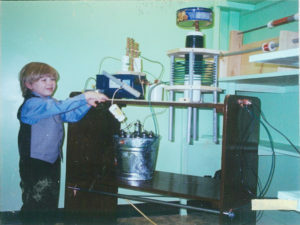 Eight-year-old Joey and his Tesla coil. Gen-1 coil. Lower level: beer-bottle capacitor. Upper level: 15-kv neon transformer with safety gap, main spark gap, primary, secondary, and terminal capacity. 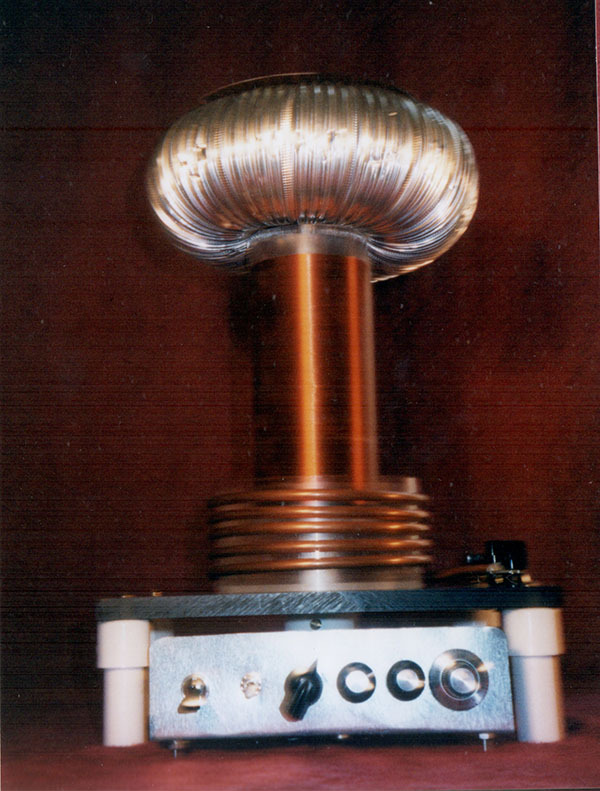 How to build a Tesla coil on any scale: see Tesla Coil book. left by Trinkaus, right by Heden. Gen 2 coils. 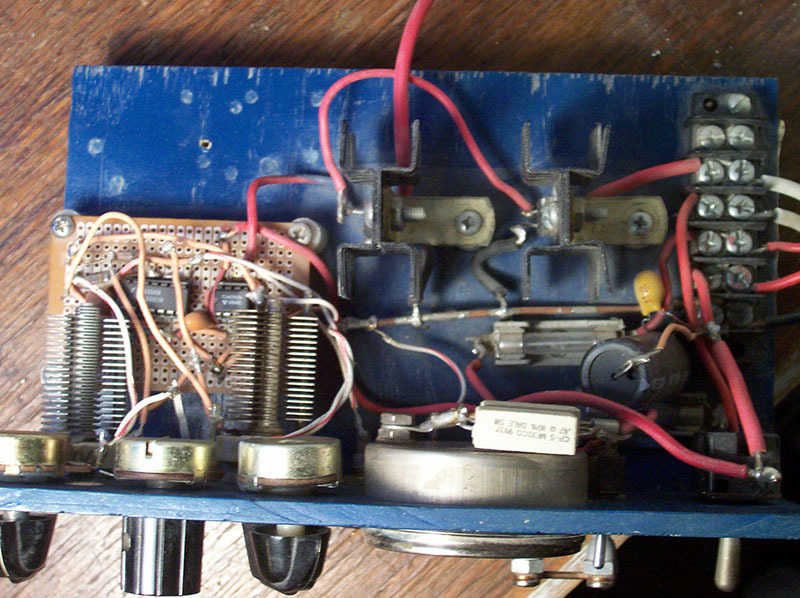 Note the large terminal capacitors, the larger width-to-length ratio of the secondary coils, and the flat primary (right). Gen-3 coil. Lower left: 5KV power supply, Inside case: 3-amp variac, 5kv neon transformer (open core, monopolar), safety gap, voltmeter, and on top, extending from the insulator, is a 30kv rectifier diode. 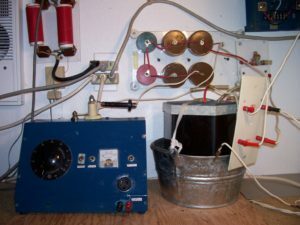 Upper left, with red coils and mica caps, is the brute-force line filter. 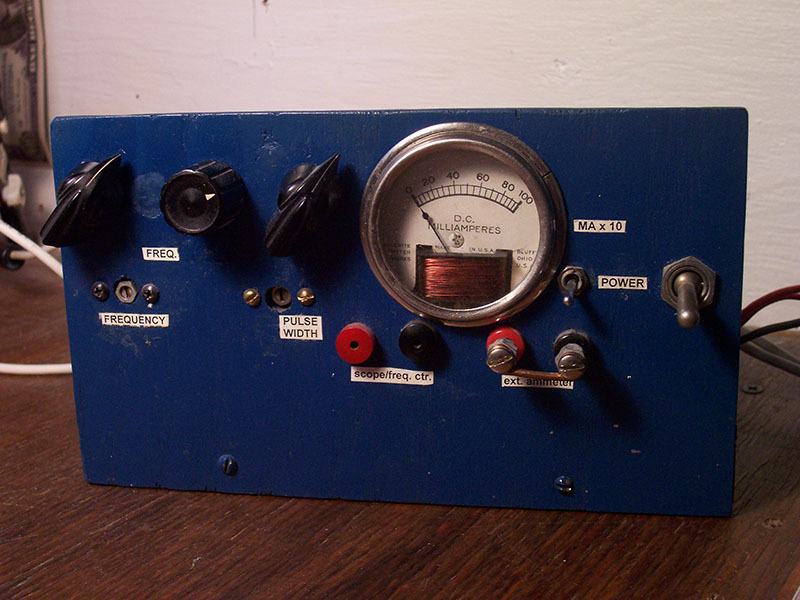 Center: high-voltage capacitor bank. Barely visible to right is the spark gap. See details below. Right: gen-3 Tesla coil, oil-immersed in “Minihex” aquarium set into galvanized tub. Attached at right is jack panel for connection to primary and secondary windings. Shown in spark mode. For the electronic mode, plug in the pulse generator shown below. 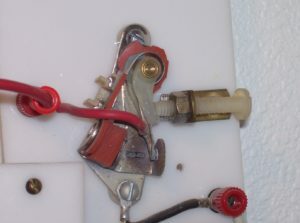 The spark gap is made from a set of automotive ignition points. I asked the parts dealer for the largest set available. This gap has endured years of trouble-free operation under low-power conditions. A nylon machine screw adjusts the gap. A spark-plug series gap would be appropriate for higher powers. Left: open series gap; right: airtight series gap. The open-gap’s plastic is polycarbonate; the airtight gap’s is ultra-high-molecular weight (UHMW). Gasket is high-temp red silicone. 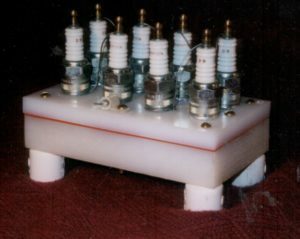 Plugs are wired from base to top of next. The plugs must be non-resistor, a challenge these days. Try marine or tractor plugs. 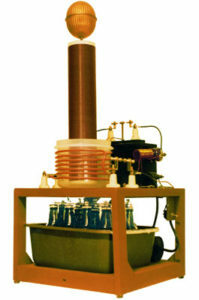 The gen-3 coil is based on Tesla’s oil-coil demonstrated in London in 1897. 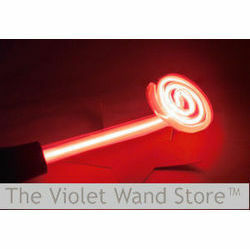 The gen-3 oil-coil, operated in the spark mode, is the best apparatus for Tesla electrotherapy. Basic pulse generator. 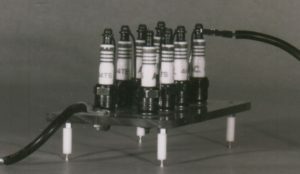 Rear: rectifier and filter, center left: power FET. The pots on the front panel control frequency and pulse width. Little pulse generator at front replaces all of the usual spark apparatus at rear. Left to right: variac, chokes/safety gap, spark gap, capacitor. 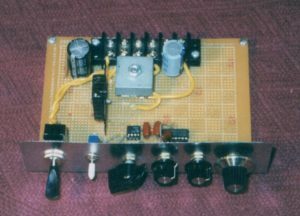 An elaborated version of the basic pulse generator is shown below. The trimmers extend the range of frequency and pulse width. 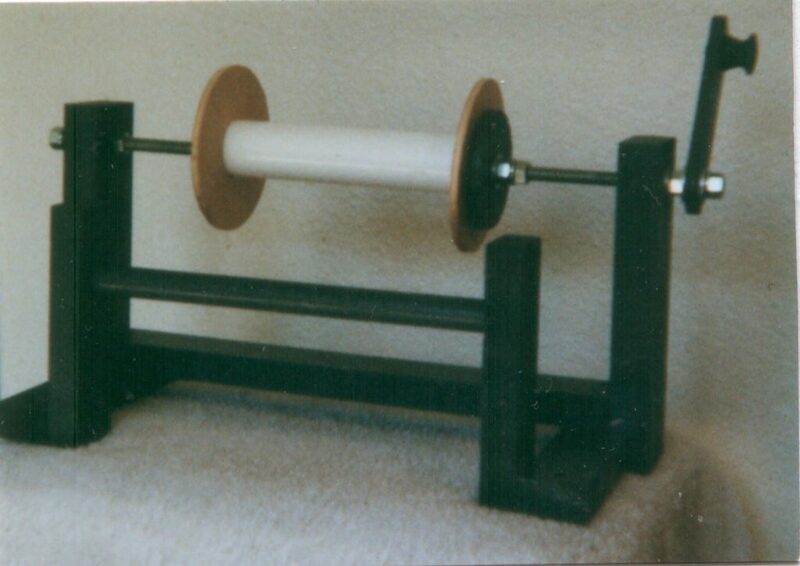 This winding jig is set up for a gen-3 coil. Tesla Technology ResearchBill Wysock designs and builds Tesla coils of extraordinary power and theatrical value. Special effects for the motion picture, television and advertising industries. Equipment for sale, lease, rental. Information Unlimited. Complete Tesla coils, kits and assembled. (800) 221-1705, P.O. Box 716, Amherst, NH 03031. Bill Beatty’s Tesla Coil Page. See the list of surplus catalogs. 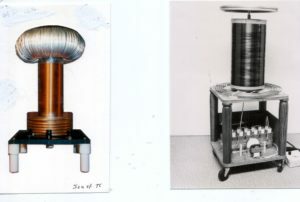 Many other resources on Tesla and Tesla coils in Bill Beatty’s science pages.